Well, the forecasters promised snow, and they didn’t disappoint. A four inch blanket of the white stuff settled on my garden overnight. So this morning, before it was even light, I was all wrapped-up in my winter woollies and outside in the freezing cold, clearing my path and driveway with my brand new, just-out-of-the-wrapper, snow shovel. The neighbours surely thought I was mad, shovelling away in the pitch-blackness. But I had paid good money for the shovel, and I was determined to put it through its paces before the snow thawed of its own accord. Completely hidden under a thick layer of snow, my wife’s car resembled an igloo on wheels. Since she would soon be leaving for work, I morphed into dutiful husband mode and unburied it for her. After ten minutes of effort, breathless and bent double with exertion, I watched her slide effortlessly into the driver’s seat, and turn the ignition. “Thanks for scraping my car,” she said, matter of fact, as if I had removed a slight dusting of frost from her windscreen. The words ‘hero,’ and ‘unsung,’ sprang to mind. As she reversed out of the drive, she waved goodbye. Still breathless I tried, but failed, to summon the energy to wave back. 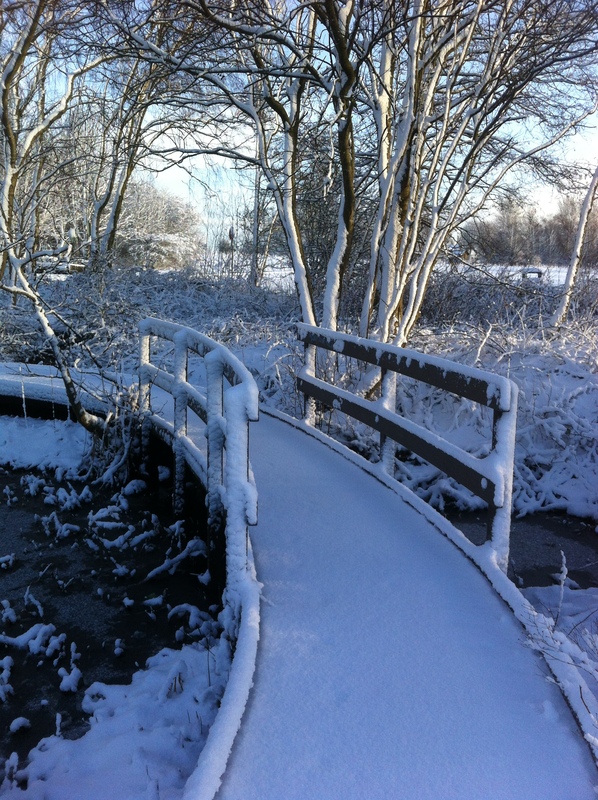 By the time the sun eventually rose, my home was a snow-free zone and I rewarded myself by walking to a nearby country park, where I hoped to snap some winter scenes on my iPhone. I arrived at the park early enough to discover that many of the snow-covered paths around the loch remained free of footsteps. I was delighted, as I think there is something really satisfying about being the first to tread a path through virgin snow. 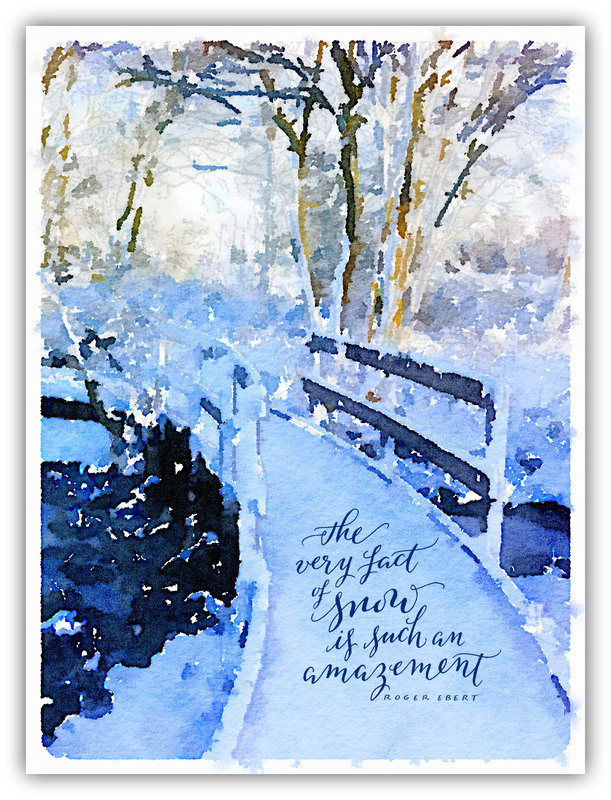 As I walked, I noticed a little snow-covered bridge up ahead, under a canopy of trees, and realised immediately that it was the perfect image to which I could add a calligraphic quotation (I’m a sad person… I know). From experience, I know that taking photographs as backgrounds for my calligraphy is different from normal photography, in that it’s essential to incorporate a blank space in the composition to contain the calligraphy that will be added later. I knew instantly that a small area of untrodden snow in front of the bridge would work perfectly. 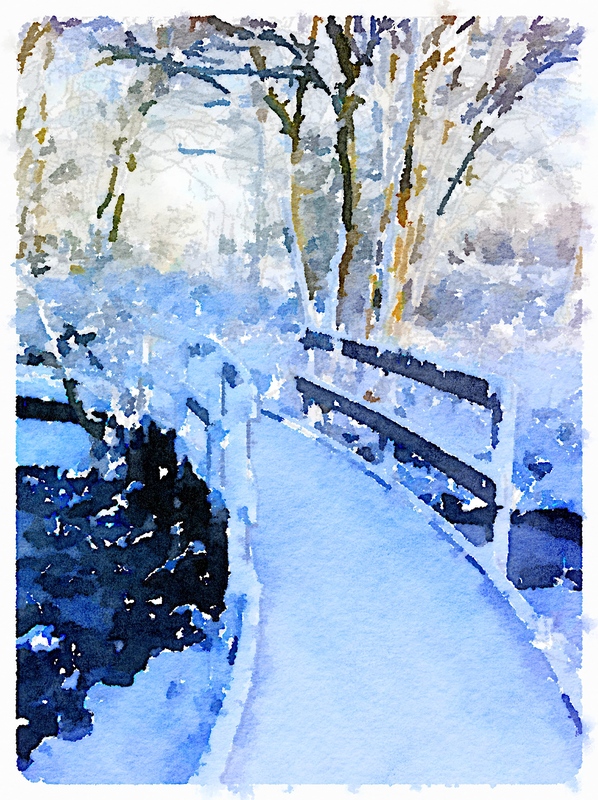 I used an amazing app called Waterlogue, that is installed on both my iPhone and iPad, to create a watercolour painting from my bridge photo. I have tried many similar apps to get a watercolour effect on my photos, but Waterlogue is by far the best. The results are spectacular, and I can highly recommend the app if, like me, you love watercolours but can’t paint to save yourself. With the “Waterlogue” effect applied. The sentiments are perfect but, unfortunately, it was too long to comfortably fit into the allocated space. Instead, I chose, “The very fact of snow is such an amazement,” by Roger Ebert. Short and sweet! As a change from my usual Italic, I experimented by lettering the quote in a pointed pen style (even though I didn’t use a pointed calligraphy nib to produce the lettering). I’ve been teaching myself a variation of this style, commonly referred to as “modern calligraphy,” and I really enjoy the informality of the script. After lettering the quotation, I scanned it into Adobe Photoshop, and inserted it onto a layer on top of my ‘watercolour’ image. I then experimented with the size of the lettering, and tinkered with its position until I was happy with the composition. Finally, I sampled a darkish blue from the background and used it to colour the calligraphy. The finished artwork is featured at the top of this post. All in all, it has been a perfect morning. Walking in beautiful scenery, photography, calligraphy, Photoshopping, blogging, and road-testing my brand new snow shovel. This might just be as good as it gets!